Late in the afternoon of the day before the s lha (eighth lunar month) fullmoon, the Buddha reached His destination, where He knew the Five Ascetics were dwelling. Now the Five Ascetics seeing Him coming from a distance, agreed among themselves that they would not get up to welcome Him, nor to pay homage to Him, nor to receive His bowl and robes. They would only lay a seat for Him so He could seat Himself thereon if He so wished. Upon His arrival they addressed Him reluctantly and disrespectfully. Even when He informed them of His success, they refused to believe and protested, reminding Him of what they thought was His utter failure in the past. It was not until He reminded them in return, asking them if He used to declare Himself like that before, that they were somewhat convinced and ready to listen. That night the Buddha stayed within the park with the Five Ascetics. "A si A si ....Konda a" Hence the appellation 'A konda a' added to his name from that time on. He requested for ordination and was admitted personally, – – by the Buddha Himself, which method was to be later 'Ehi' ordination, from the Buddha's formal words of admittance beginning with Ehi i.e. Come. He was therefore the first Bhikkhu in Buddhism. After that time the Buddha gave the remaining four Ascetics sundry instructions until they all won the Eye of Dhamma and were likewise ordained as Bhikkhus in the same manner as Konda a. It was on the fifth day after the fullmoon that the Buddha preached His second sermon called Anattalakkhana S tta (Discourse on Selflessness) to the Five Ascetics. His sermon culminated in all of them attaining the Arahathood, highest grade of the Noble Disciples, There were born in the world at that time six Arahants, including the Buddha Himself. The rainy season year still saw the Buddha and the Five Ascetics staying in the deer-park of Isipatana. In the small hours of one night, while the Buddha was engaged in walking meditation, there was something dramatic occuring in the city of Benares. A youth by the name of Yasa, son of a wealthy man, happened to wake up from his sleep at that time of the night and as a result to see his concubines in the chamber sleeping in various careless and indecent postures. It happened to him in a flash how they looked like corpes instead of lovely maidens they used to be. Suddenly disillusioned, the youth put on his sandals and went out of his residence, complaining to himself, "How troublesome it is here! How doleful it is!" He was still complaining while walking all the way to where the Buddha was staying. Hearing his complaints, the Buddha responded, saying as if to no one in particular, 'This place is not troublesome; nor is it doleful, Do come this way," The youth, hearing the Buddha's words approached the Buddha and, having taken off his sandals, seated himself before the Buddha. In response to his temperament the Buddha preached to him the sermon on the Five Progressively Important Themes ending up with the Four Noble Truths. At the end of the sermon Yasa was enlightened into the Noble Fruition, becoming thereby a Streamwinner, first stage of the Noble Disciple. A few days later, four of Venerable Yasa's friends in Benares viz. 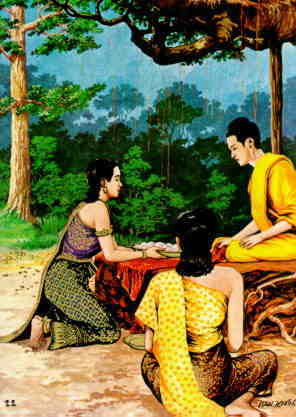 Vimala, Sub hu, Punnaji and Gavampati, having learnt of their friend's renunciation, came to see the Buddha, who preached to them until they all attained the Arahathood, highest grade of the Noble Disciples. They were ordained by the Buddha Himself, in the same Ehi manner as before. There ocurred in the world at that time 11 Arahants. Some time later another fifty of Venerable Yasa's friends having learnt about what had happened came to ask for ordination as before. The Buddha preached to them and, having enlightened them, granted ordination in the same manner. There were at that time sixty one Arahants altogether.